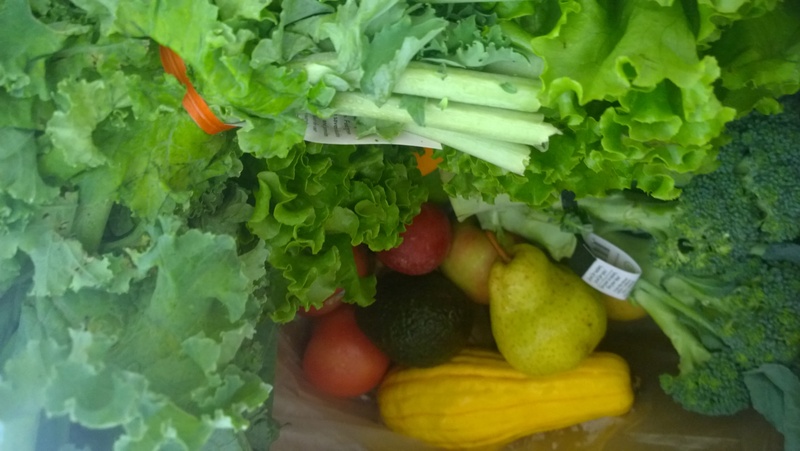 Regular blog readers know my feelings on the connection between diet and health. I started my journey to discovery about 3.5 years, ago, when I went gluten-free. Ever since, I have pushed to find the root cause of my body’s mission to attack itself in myriad ways, and further modified my diet. These days, I’m evolving my diet in reverse, and eating mostly like a cavewoman. Whatever fruits are in season. I’m lucky to live in Florida, where it’s always growing season. I also love frozen berries, especially in smoothies. Wine: Strict Paleo diets remove alcohol, but a few times a week, I enjoy a glass (or two) of good red wine. It’s soul satisfying to share an evening, and a glass of wine, with my wife after a long day. We’ve also made a hobby of discovering new ones together. Unless I am desperate, I won’t get rid of it. Soy: This is my biggest daily variation from pure Paleo. I am aware of the issues regarding soy. I buy the best products I can, all organic and non-GMO, and I do not use it excessively. My wife has a coconut allergy, so our family meals cannot include coconut, whether aminos, milk, or oil. 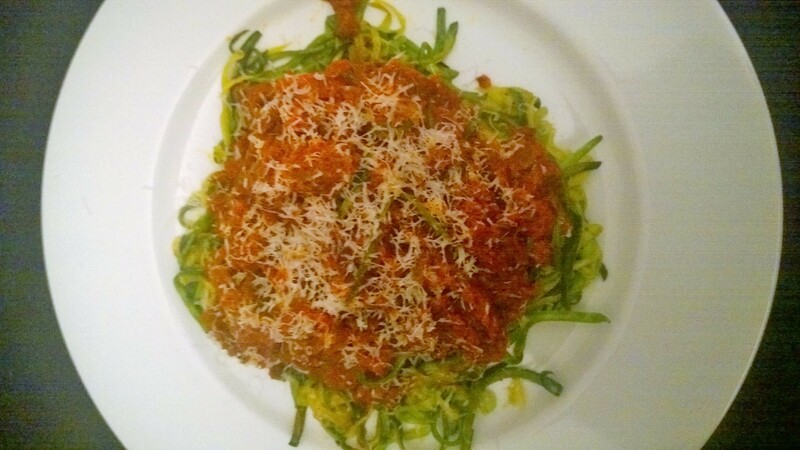 Homemade meat sauce over zoodles, with bonus Pecorino! Brown/jasmine rice: I’ve tried, but I really can’t get down with cauliflower rice. I adore roasted cauliflower, and I love zoodles, but I am also okay eating brown and jasmine rice from time to time. Beans: Since I started eating this way, I haven’t really craved beans. However, I’m keeping them on the list for now, because they’re delicious, and because there is conflicting evidence about their nutrition. Non-cow dairy: A small hunk of manchego, gooey goat cheese on a bunless bison burger, or a bit of shaved pecorino romano over zoodle pasta with meat sauce can make my day. This is what works for me. Some of the foods are verboten, but I don’t pretend to be a Paleo purist. To this point, I haven’t adopted the autoimmune protocol (AIP) either, though I’m not ruling out a trial down the road. And my diet evolution has been wildly successful. In just a month, my energy is up. My digestive problems (just going from gluten/dairy free to mostly cavewoman) have been reduced by 60-70%. I’ve even lost a few pounds, though thanks to age and Prednisone, weight loss is a maddeningly slow process. Right now, my major obstacles revolve around eating this way on the road, and making time to cook what I eat. I’m still wrestling with both. In my next post, I’ll share what I’ve learned so far, and will give you a list of caveperson resources I love. Until then, I’m heading back into the kitchen! I am actively trying to make the paleo diet a part of my lifestyle as well. Diagnosed with RA in 2007- and really, feel that’s there’s not many good excuses for not trying to eliminate irritating elements to this autoimmune disease. Change is very hard though. I find comfort in my sugar and bread- and this will be a major challenge for me. I completely understand that…I used to make meals out of cheese and a good baguette! 🙂 But, the changes have helped me feel better, and that helps keep me motivated. Please stop back by and let me know how it’s going for you. Thanks for reading, and I wish you the best of luck in your journey!